From Rte. 22 in Ebensburg, take Rte 219 North to Carrolltown. In Carrolltown turn right onto Carroll Rd. (SR 4015) towards Patton. In Patton, turn right onto Magee Ave., then an immediate left onto 4th Ave. (Rte. 36). Go a few short blocks and take a right onto Railroad Ave. Cross the railroad tracks and take the next left onto 3rd Ave. Turn right onto Highland Ave. Follow this road, which after a left turn, will turn into Ridge Ave. Ridge Ave. turns into St. Lawrence Rd. Take St. Lawrence Rd. 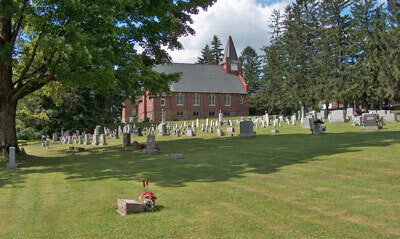 to St. Lawrence where the cemetery will be on the right side of the road.